Urine can be notoriously embarrassing- ask the boys and girls in elementary school and they will tell you about it. Ammonia-based bleaching agents have a distant smell of urine but this cannot be compared to what many people have to grapple with everyday. Are you one of those people who have been trying to get rid of urine smell from your toilet for ages now to no avail? 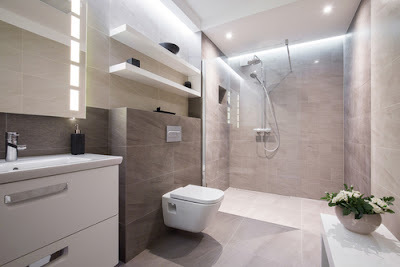 Well, there is a lot you need to learn about human urine and plumbing systems so that you can be able to get rid of that foul smell coming from your clean toilet. It is proven fact that men’s urine is bound to smell more powerfully than that of women. You need something to testify to that? Make a quick drop by a truck-stop’s men’s toilet and you will not want to spend more than a couple of minutes there. Those toilets stink to high heaven. In some of them it is not that they toilets are not washed but rather the contents of the urine that is being deposited there by the men. Boys and men have very powerfully smelling urine. However, at times even women do. The concentration of ammonia in urine will either cause it to stink or not. If there is a lot of ammonia in the urine then obviously there is going to be lots of stink all over the place. However, people who drink lots of water do not have to worry about such smells because the water content will be more than the ammonia. What you eat can increase the amount of ammonia in your urine. Spicy foods and certain vegetables such as asparagus are notorious for making urine stink. Well, this does not mean you should not eat them. All you need to do is drink lots of water and the stink will be diluted. 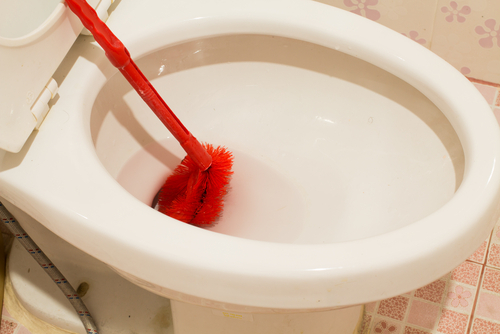 Brushing the toilets, including under the rim, at least twice a week might help to solve the problem. Some people just do not have time to clean their toilets that frequently. Make sure that the toilet bowl is always with clean water after every use. This will prevent the urine from staining the toilet or the smell from sticking to the walls of the toilet. 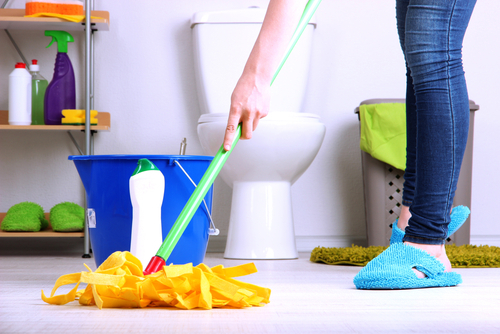 Carpets and shower curtains plus other items can soak up the urine. The result is that there will always be that smell of urine all over the toilet. Changing all the fabrics in your toilet is likely to get rid of the smell especially if you have kids who are constantly missing the bowl. Sometimes the fumes from the drainage pipes flow back into the house. To keep them under control there are air fresheners specially meant for the toilet. Spray your toilet and then cover with the lid. The scent from the freshener will dissolve into the water in the bowl and neutralize the smells from the piping. This is a very common problem especially when it is hot. The gases are heated and they have to find the shortest route to pass through. Obviously you will prefer the smell of lemon to the awful urine smell that is in your toilet. Therefore you can clean your toilet with a lemon juice and baking soda. This is a two-in-one remedy for the smell and the stains. It is a proven fact that baking soda is a powerful bleaching agent. Therefore what you can do is make a paste using baking soda and lemon juice and spread it along all the joint of the toilet. Spread the paste under the rim of the toilet and also at the bottom of the toilet where it meets the floor. Allow the paste to sit for about 15 minutes and the drizzle white vinegar on it and let it fizzle. Once the fizzling is over you can then proceed to clean the toilet with a dump cloth (at the bottom of the toilet). For the paste under the rim simply brush after fizzling with vinegar. The yellow, brown and black stains on your toilet will be gone and so will the smell. When you encourage your kids to drink more water you will have less of a problem with the smells in your toilet. Practically all users of the toilet should be encouraged to drink water. Dilute urine does not smell too much. There are several wrong things that people tend to do when the smell becomes a nuisance to them. One of these things is mixing up chemicals. No one wants to die in a toilet and a smelling one at that. Mixing up cleaning agents is a recipe for getting yourself killed. Some of the toilet-cleaning agents are incredibly powerful and they can react with other agents that you mix with it. The fumes produced can choke you to death. The worst part of it all is that the fumes can stay in the toilet for a very long time. Secondly, you should avoid flushing the toilet too much. In most cases this is more of a waste of water than a urine smell eradication option. As you might have noticed, sometimes the problem is not inside the toilet bowl but outside. Make sure you know what is causing the problem before you spend a fortune on water bills.